ATVs are dangerous. Especially if you're not wearing a helmet and seatbelt while operating them. A bunch of people weren't smart enough to figure that out and sued Yamaha for negligence. Yamaha just won the first case. The first of hundreds of similar suits, the jury in Johnny Ray vs. Yamaha Motor Co. just found in favor of Yamaha, decided that it wasn't negligent in the death of 13-year old Forest Ray. Ray was killed over two years ago when his Yamaha Rhino rolled while driving off grass and onto pavement. Yamaha places prominent warnings on all its ATVS that they shouldn't be used on-road and Ray wasn't wearing his seatbelt or helmet at the time of the accident. Ray's family argued the lack of rear differential gears on the Rhino would have prevented the rollover, but Yamaha countered by saying that the Rhino is only designed for off-road travel, where a rear differential is more of a safety "demerit." 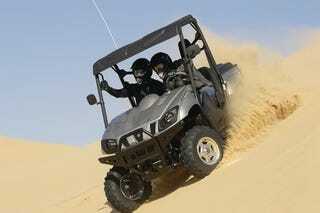 The Rhino is fitted with both seatbelts and a strong roll cage.